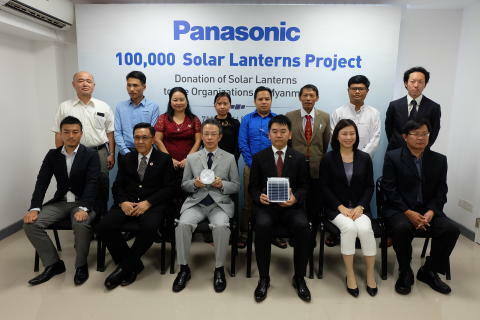 Yangon, Myanmar, 7 November 2016 – Panasonic Corporation donated 2,400 solar lanterns to 9 Humanitarian and Non-Governmental Organizations in Myanmar; its second initiative this year in continuation to its “100 Thousand Solar Lanterns Project”. The 4-year donation drive has seen a total reach of 11,864 solar lanterns in the country, presently. A donation ceremony was held at the Panasonic Showroom & Service Centre in Yangon. Currently, an estimated 1.2 billion people, or about 17%1 of the world’s population live in areas without electricity. In Myanmar, non-electrified areas are at the highest level among the ASEAN countries, at approximately 68%2 across the nation. With the lack of electricity, it means daily lives can be greatly affected. The aim of the Panasonic global “100 Thousand Solar Lanterns Project” is aligned to improve such electrification needs, namely - access to education, healthcare and business opportunities through the use of the company’s own technology and product. Each donated solar lantern is attached to a solar panel. Through the use of renewable solar energy, the product not only mitigates social challenges, but also contributes to carbon dioxide emission reduction. Till date, the target remains to donate 100,000 units of the compact lighting devices to areas in emerging and developing countries with limited access to electricity by 2018, the company’s 100th year anniversary. Panasonic hopes its solar lanterns will provide a better life, a better world for the people of Myanmar and contribute to the achievement of the Sustainable Development Goals (SDGs).